Will this be the invention to finally quiet our indignant calls for flying cars and jetpacks? 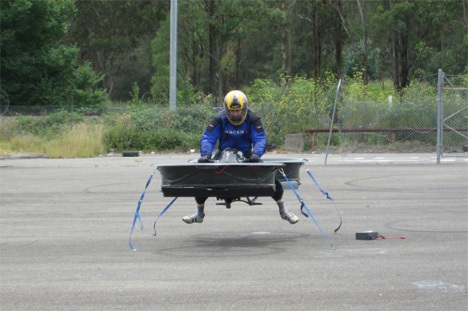 The Hoverbike, invented by Australian Chris Malloy, is a prototype that was built in a garage over the course of two and a half years. Its twin propellers are powered by an 1170 cc engine and according to Malloy would be able to lift the bike to heights of over 10,000 feet. 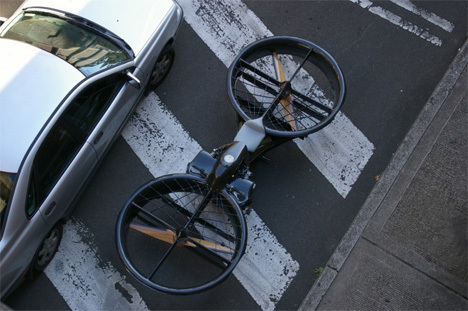 The incredible Hoverbike would take adventurous bikers on a high-speed sky ride, reaching speeds of up to 173 miles an hour. The body of the bike is made of carbon fiber reinforced with Kevlar, while the propellers are strong Tasmanian oak. The bike looks almost like a standard motorcycle, but with the “wheels” turned sideways. So far it’s only been tested while tethered to the ground, but Malloy hopes to start full-on testing within a couple of months. Like a dual-rotor Chinook helicopter, the two propellers spin in opposite directions and negate one another’s torque reaction. The driver controls the massive airborne beast with a set of rather small-looking handlebars. 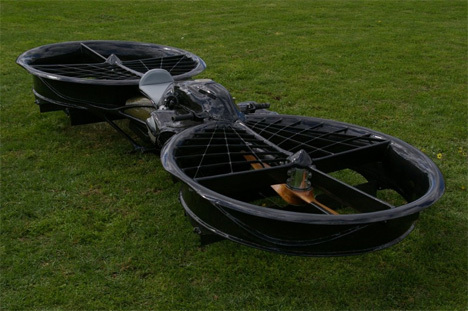 According to the inventor, the Hoverbike will be able to do almost anything a helicopter would do. 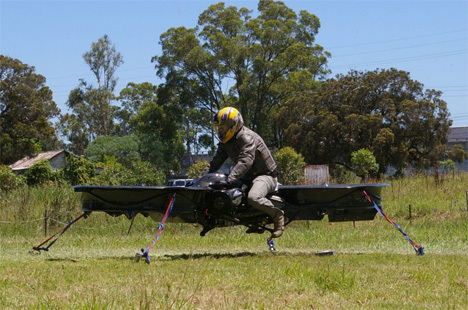 But because it’s classed as an ultra-light flying vehicle you wouldn’t even need a pilot’s license to fly one. Although visions of Jetsons-type commutes might be dancing in your head right now, Malloy actually intends the bike to be used as a working vehicle. He envisions it being used to herd animals, aid in search-and-rescue missions, or even provide aerial film crews with a new platform. The first production run of the vehicle could be underway by late 2012, with the expected price point around $40,000. With a high number of pre-orders the price could come down significantly to make it comparable to a high-end land motorcycle. See more in Mods & Custom or under Transportation. June, 2011.